Alexander Des Forges. 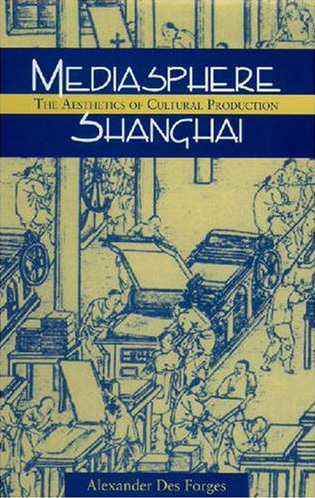 Mediashpere Shanghai: The Aesthetics of Cultural Production Honolulu: Hawaii University Press 2007. 320 pp. ISBN-13: 978-0-8248-3081-6 (coth). Alexander Des Forges’ Mediasphere Shanghai focuses on and advocates the relatively neglected genre of Shanghai fiction (haishang xiaoshuo) from the 1890s through to the 1920s. As distinct from the modernist “Shanghai-style” (haipai) works of the 1930s and 1940s by authors such as Liu Na’ou and Mu Shiying that have been the subject of so much attention recently, these works of instalment fiction, which focus on Shanghai’s leisure industry, have been regarded as of lesser importance. May Fourth authors and their advocates, for example, have criticized these works as an immature mode to be abandoned. One of Des Forges’ key tasks throughout Mediasphere Shanghai is to trace how this critical paradigm was established (even by admirers like Eileen Chang). In his final chapters, he counters it by tracing not only traits shared with the May Fourth and modernist fiction that supposedly defined itself against this earlier work, but also how it links into today’s Shanghai nostalgia that looks forward (as well as backward) to a renewed cultural centrality for Shanghai in the twenty-first century. Key works of Shanghai fiction examined in this book include Han Bangqing’s Lives of Shanghai Flowers (Haishang hua liezhuan), which Des Forges is well aware has certainly not been overlooked by critics. This is perhaps one of the earliest works in the genre, which by definition refers directly to Shanghai in some way, and includes the less well known but also very popular Sun Yusheng’s Dreams of Shanghai Splendor (Haishang fanhua meng) and Bao Tianxiao’s Shanghai Annals (Shanghai chunqiu). Des Forges’ core argument is that these writings, which mostly appeared first in instalments before being published in book form and running to numerous editions, do more than reflect or even represent Shanghai of the period. Instead, he argues, they are part of a larger mediasphere that constructs an image of Shanghai and Shanghai life that circulates often even to readers who have no knowledge of the city. As a result, when visitors arrive in the city they can cry “So, this is Shanghai!” in recognition of what they have already read about. The greatest strength of the book is Des Forges’ careful, detailed, and convincing analysis of the genre, which corrects many misapprehensions and gives these works their due. The most intriguing part of the work is, however, the idea of “mediasphere” as a framework for analyzing cultural forms. However, in this regard, like much of the fiction it analyzes, Mediasphere Shanghai tantalizes but always leaves you wanting more. First, Des Forges analyzes Shanghai fiction’s attention to geography, territory, and language. He points out that it is a measure of the genre’s enduring cultural impact that its categories of place are usually taken for granted, as though they are mere reflections of reality. Des Forges argues instead in his first chapter that this spatial vocabulary should be understood at least partly as a product of these novels, in which “Shanghai serves as a factory of local, regional, and national identities” (p. 30). For example, it would be an error to think that the innovative use of Wu dialect in Lives of Shanghai Flowers is a mark of mimetic accuracy. First, the Wu dialect used in the novel is an abstracted version of the Suzhou dialect, and it is spoken by Shanghai courtesan characters, whose real-life counterparts would not necessarily have spoken it at all. Second, the non-dialogue part of the novel is written entirely in northern vernacular. In this way, the novel signifies Shanghai as the most visible source of domestic Chinese heterogeneity by setting up two exclusive language groupings in a manner that is at the same time not mimetically accurate at all. Similarly, great care is taken in these novels to clearly separate the Chinese and foreign within Shanghai, overlooking resident foreigners in the city who have a kind of local status and also Chinese residents of the concessions, not to mention the porous and shifting borders of the concessions themselves. In this way, Shanghai is signified as a hybrid space in another way. The foreign and the national are distinct but rub up against each other, and the overly clear separation between the concessions and the “old city” means they can be assigned distinct narrative functions and significations to serve the fiction. This construction of binary spaces and peoples comes up again in chapter 5 of the book, where the quintessential characters of Shanghai fiction are analyzed, including the broker, who profits from the separation of these various worlds within Shanghai and the need for middlemen to work between them. Other key figures examined in this chapter include those often-twinned cultural entrepreneurs, the courtesan and the professional author, and the “Shanghai person” (Shanghairen or Szahaenin). The latter is a rare Chinese local identity determined not by birth but by migration. While the depiction of the different social elements making up the famously hybrid environment of Shanghai might not be mimetic, descriptive accuracy is a prized component of Shanghai fiction in other ways, but still for reasons different from a simple drive toward mimesis. First, there is a wealth (if not a welter) of location detail, with numerous parks, avenues, lanes, theaters, and other real sites meticulously described with precise distances and travel times between them taken into account. In chapter 2, Des Forges points out that this carefully delineated grid of places and times provides a vital framework for managing the great number of storylines and bringing them into relationship with each other. Where earlier Chinese long fiction pieces mostly depended on literal family genealogy to knit the characters together, in Shanghai fiction this is not possible as the nature of Shanghai as a place people migrate to in search of fame and fortune means that most of the characters are unrelated to one another. Furthermore, each space is associated with particular kinds of narrative actions (parks as places of conflict, alleyways as avenues of connection, and so on). In addition to these narrative functions, Des Forges argues for resisting any tendency to interpret accurate detail as realism, and instead invokes the idea of referentiality. Where realism developed later as part of an analytical and cathartic way of not only depicting but also interpreting society, Des Forges sees the referentiality of Shanghai fiction as part of the larger mediasphere intertext that invokes a larger Shanghai not only for a readership familiar with the city but also for a readership that the genre induces to desire the city and its consumer pleasures. Numerous narrative threads with no clear division into a dominant plot and sub-plots constitute another key characteristic of Shanghai fiction. In chapter 3, Des Forges argues that this creates an aesthetic of simultaneity and interruption. This is not only manifested in the text, where readers are switched back and forth frequently between various plotlines unfolding in different places at the same time. It also occurs in the instalment mode of the fiction, where publication in newspapers ensures that readers are reading each instalment at more or less the same time, and are interrupted from one instalment to the next. Des Forges understands simultaneity through Benedict Anderson’s concept of the “imagined community,” which is bound together by such practices. But where Anderson sees this as constructing the nation-state, in this case it creates a shared imagination and knowledge of Shanghai. Interruption, on the other hand, generates desire and suspense, helping to sustain interest (and regular newspaper sales). The generation of desire in relation to consumption and the potentially endless quality of instalment fiction itself is the subject of Des Forges’ fourth chapter. The careful delineation of the genre’s characteristics and development, as well as its connections to later works, makes Mediasphere Shanghai an important work for the ever-growing ranks of scholars interested in late Qing and Republican Shanghai culture. However, the idea of the “mediasphere” evoked in the title and attributed to Regis Debray in the introduction raises many interesting questions that deserve more attention in at least two regards. First, although I have no problem with the plausibility of the claim that Shanghai fiction sits in a web of intertexts that includes advertisements, posters, guidebooks, plays, cinema, and more, this intertext is surprisingly absent from the book. Of course, it is true that to cover this wider range of texts would be very demanding, but perhaps this demonstrates a mismatch between the continued dominance of literature in Chinese Studies and the intellectual and conceptual paradigms that are now developing in that field. An idea such as the “mediasphere” seems to demand a de-privileging of any specific textual mode to investigate how tropes, figures, locations, narrative conventions, and more travel across texts. There is some discussion of this in regard to cinema in Mediasphere Shanghai, but I think this merits much more attention if we are to grasp the full fertility and creativity of a cross-mode intertext. No doubt this will be a project for the future, although it already meshes with some of the other work being done in the field (much of which is also cited in Mediasphere Shanghai). Second, I could not help noticing similarities between the idea of the “mediasphere” as a set of textual figurations that construct (rather than reflect) our understanding, and the much older idea of “ideology,” especially as developed by Althusser. Whereas earlier Marxist theorists saw ideology as a false representation of the truth, Althusser saw it as lived, and believed there was no space outside ideology. In this sense, it seems very close to the mediasphere. But what are the differences between this older and once well-established Althusserian concept of ideology and the mediasphere? What is at stake in a decision to turn to the mediasphere rather than an Althusserian idea of ideology? Is it to avoid grounding the work in the Marxist vision of society and political change that underpins Althusser’s work? (Certainly Des Forges appears to be critical of Mao Dun’s worldview in discussions of his work in the book.) If so, what is the understanding of society and politics supported by the mediasphere? And what happens to the understanding of power and interests at play in the production of the figurations and patterns circulated in the mediasphere? Of course, the critique of the supposedly frivolous nature of Shanghai fiction from a politically engaged position underlies its prior neglect, so further explicit and detailed engagement with these questions seems important not only for further work but also as part of the project of legitimating Shanghai fiction.